If you have kids, you've likely gone through the ritual of helping them grow out of peeing the bed. If you're like me, one of the nightly edicts was "don't pee the bed". And more times than not, they pee the bed anyway. As far as 'listening' and 'doing' go, from the sentence "don't pee the bed" our kids mainly just hear the dominant phrase "... pee the bed". And their subconscious mind goes to work doing what's it told. And they wake up with soiled sheets. Again. Bear with me, I'm getting there! So, what would have the result been if the direction was "wake up when you have to pee and go to the bathroom?" As leaders, we often rely on the same approach: directing subordinates what NOT to do instead of coaching them on a better way. Example: "Do Not Park Here" posted in a parking space. While most of us may follow that command, what would everyone's attitude be if the sign instead said: "Parking Here Makes it Harder for our Caterer to Deliver Your Food While it's Still Hot"? Simple, silly example right? Well, let's visit a more consequential topic: Crisis Response Leadership. Some of the instructor-led courses I currently teach involve the simulation of an incident, an incident command post (ICP) and an emergency operations center (EOC). Three separate areas of an incident with three separate functional responsibilities. 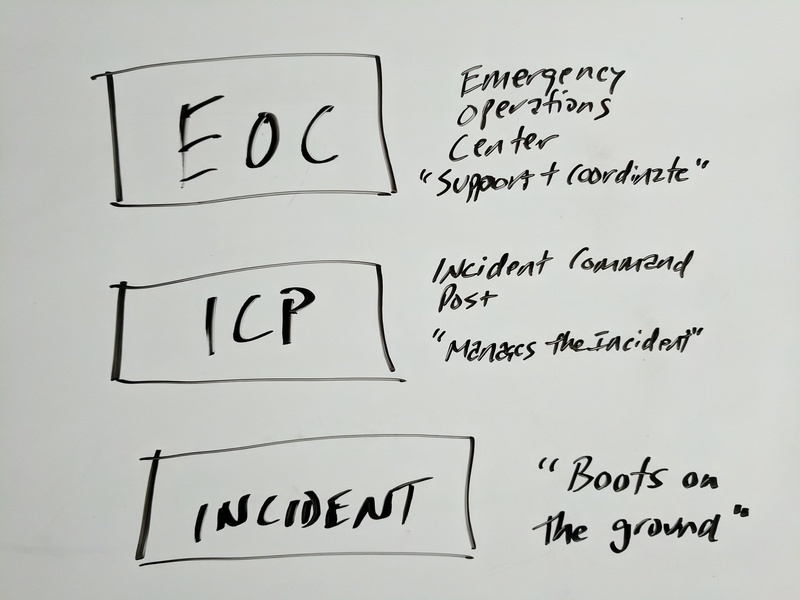 Most folks that attend these courses are comfortable operating at the Incident level as 'boots on the ground' responders. For them, it can be a challenge to change their mindset to be successful at the ICP (managing the incident) or EOC (coordinating with and supporting the incident) level, since they each have different responsibilities they are not used to. It's quite common for these folks to devolve back to a "boots on the ground" mindset, a/k/a their comfort zone. To counteract that, they're frequently instructed to "Don't Think Like a Responder!" And what do they do? They either think like a responder or they get stuck in a state of conflict over what to do and WHY. - When we designate part of our mindset to remember what it's like to need 'competent incident management' (ICP) or 'greater support and coordination' (EOC), we're more likely to be purposeful in our decisions because we know what the person needs and why. - In this scenario, the responder is our internal customer and when their needs are at the forefront of our mind, we can better serve them. Explaining what and why (when time allows!) instead of just barking commands is a more effective way for leaders to achieve results and to build the confidence and competence of those around them. And that's true whether they're helping their kid stop peeing the bed or leading troops into battle. Lesson: Don't overuse your authority! I mean, use your authority to explain what and why (or why not) in order to promote greater trust and engagement.